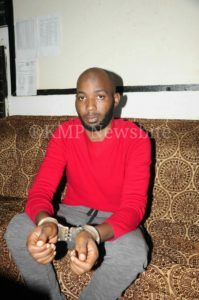 Godfrey Wamala, the key suspect in the murder of singer Moses Ssekibogo alias Mowzey Radio has, in a statement to police, denied involvement in the crime. Wamala, who is also known as Troy, was on Sunday, February 4 arrested in Kyengera where he was in hiding, and interrogated by police. He told police that it is the bouncers that intervened when the late Ssekibogo had a disagreement with the bar owner, George Egesa. “Bouncers were later asked to take Mowzey out. I followed later and found him down with people gathered around him… I never touched him and later I went to play video games,” Wamala said. On why he ran into hiding after the incident, the 28-year-old told police that he was trying to find safe custody for himself after hearing his name being mentioned among those who beat Radio into coma. But the police spokesperson Emilian Kayima yesterday said they have moved a greater step into bringing to book those who caused Radio’s death because Wamala is the number one suspect. The arrest of Wamala brought the total number of suspects in custody to three. The others are Egesa and a one Lugere. According to Producer David Ebangit Washington, all the disagreements took place when he was seated on a different table from that of Radio because he doesn’t take alcohol. But Wamala says they all sat together. “The table had Hassan Lukwago, George Egesa, Mowzey Radio, Washington and myself,” Wamala narrated to police on Sunday. Also, in his eye witness account with a local TV yesterday , Washington recollected how a one Pamela called Radio who was with Washington at the deceased’s construction site. Washington narrated that upon receiving the call, they walked to the bar to join the others. He continues that after a while he went and rested in the car outside, but it remains mystery which car since they had “walked to the bar”. However, amidst all the statements and mystery about who exactly beat Radio to cause him head injuries that led to his death, police say they are confident the truth will be found out soon.